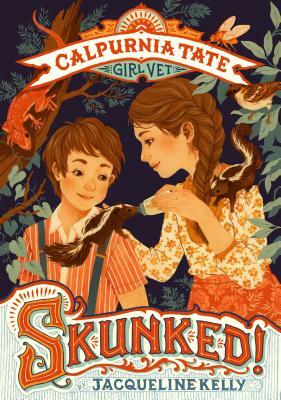 From Newbery honor author Jacqueline Kelly comes Skunked!, a new illustrated chapter book series for younger readers featuring the beloved characters from The Evolution of Calpurnia Tate. In Calpurnia Tate, Girl Vet, Callie Vee, Travis, and Dr. Pritzker help animals big and small. When soft-hearted Travis discovers an abandoned baby skunk, he can't help but bring him home and take care of him. Stinky, as Travis names him, settles in pretty well. But when Travis discovers Stinky's litter-mate, Winky, who is in need of some help, things get complicated around the Tate house. One skunk is a piece of cake; two is just asking for trouble. Will Travis and Callie be able to keep the critters away from Mother's careful eyes—and nose? Don't miss the next book in the Calpurnia Tate, Girl Vet series: Counting Sheep. And don't forget the Calpurnia Tate books for middle-grade readers: The Evolution of Calpurnia Tate and The Curious World of Calpurnia Tate. Teagan White is a freelance illustrator who specializes in intricate drawings of flora and fauna. Originally from Chicago, Teagan now lives and works in Minnesota, where she received a BFA in illustration from the Minneapolis College of Art & Design in 2012. She is the cover artist for the Calpurnia Tate, Girl Vet series by Jacqueline Kelly. Jennifer L. Meyer is an award-winning artist whose work has been featured multiple times in the Best in Contemporary Fantastic Art annual, Spectrum. Born into a fantasy-loving military family, she grew up a big fan of comics, reading, and drawing animals (especially bunnies). Jennifer's art has appeared in comic books, children's books, graphic novels, and other media. She is the illustrator of the Calpurnia Tate, Girl Vet series by Jacqueline Kelly.